Vincent Pirruccio has worked for most of his life as an artist. His sculptures are magnificent and important. Books have been written about him, though I’d never seen any of his pieces up close. 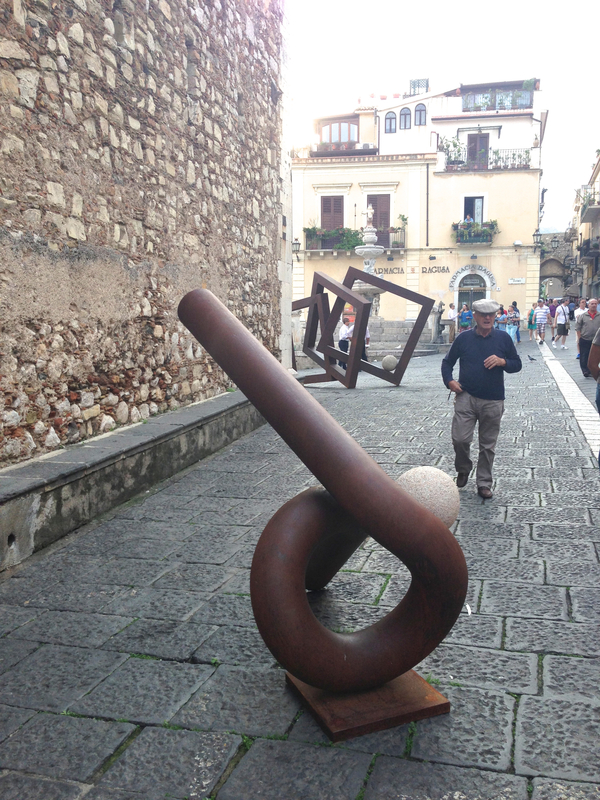 I was lucky to be in Taormina where his exhibition, The Geometry of Space, took place last fall. 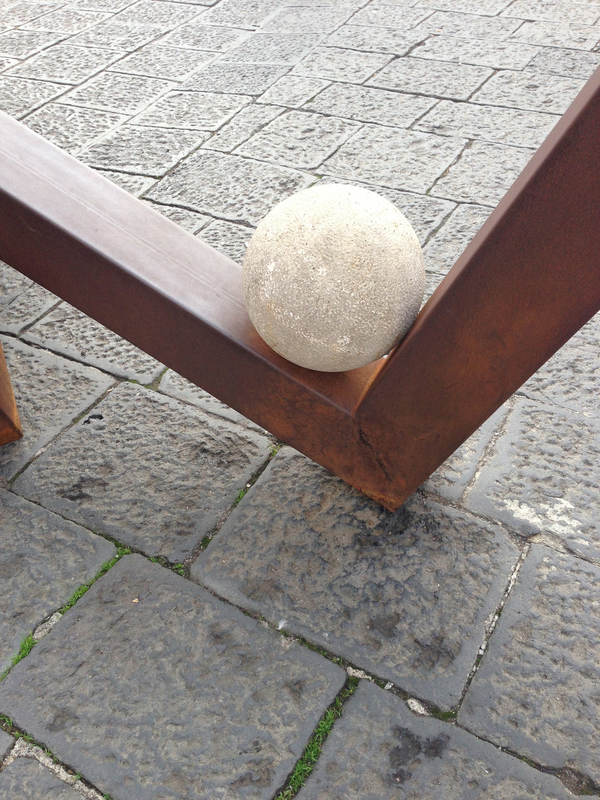 Pirruccio’s work juxtaposes the massive weight and size of his pieces, against a feeling of lightness and air. He marks his space, in an overpowering masculine way, while framing it and inviting people in. He dominates in what looks like solid iron, but creates transparent intimacy. The heavy metal structures seem totally immovable, requiring cranes to set them in place. Yet the small ball in each of the works wreaks havoc, sending each piece off balance, skittering into uncertainty. 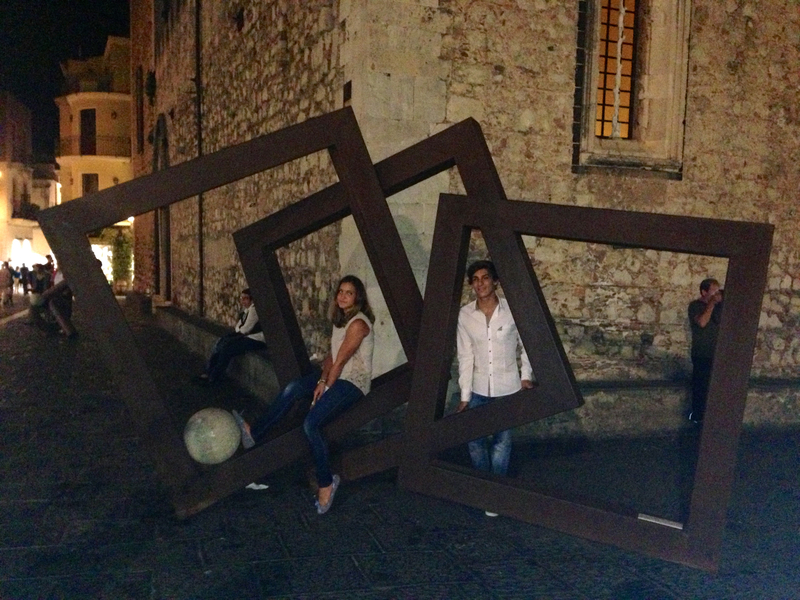 In Italy, I became acquainted, not only with his work, but with the sculptor himself. He’s warm and loving, and shares his insecurities and vision in such an honest, vulnerable way, you can’t help falling in love with him (and his lovely wife) instantly. I suppose those insecurities strike a chord with me as both a writer and as a person. He thrusts at all of us the feeling we’re never good enough, the constant thread of insecurity that keeps our entire existence off balance. We’re taught stability, like symmetry, are akin to serenity. Vincent Pirruccio finds beauty in the chaos — beauty in the reality of our lives. 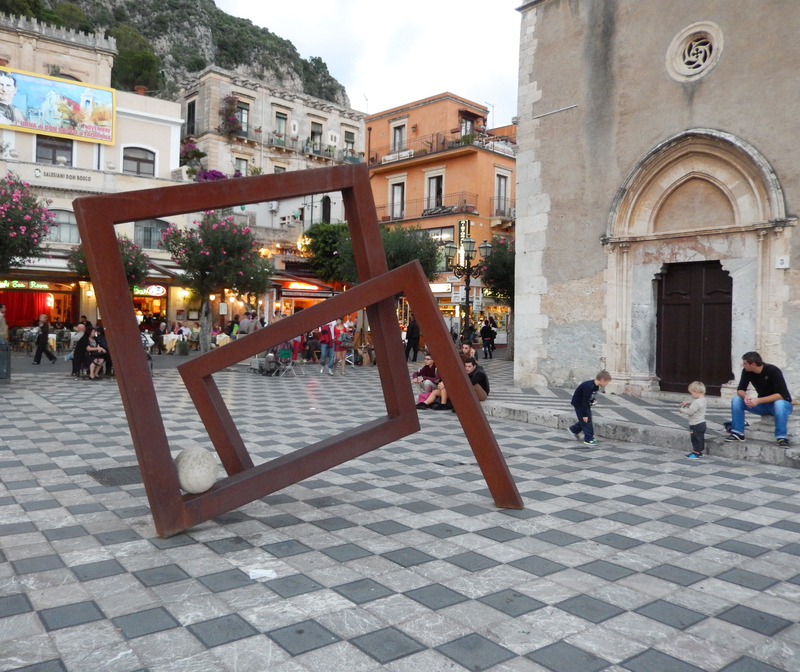 Here in Taormina, a town literally in the shadow of Europe’s most active volcano, where modern art meets ancient city, that contrast is all the more powerful. The photos here are mine. Not professional or up to standards by any means. I was supposed to receive professional photos from someone who has done a book on Pirruccio, but they never arrived. 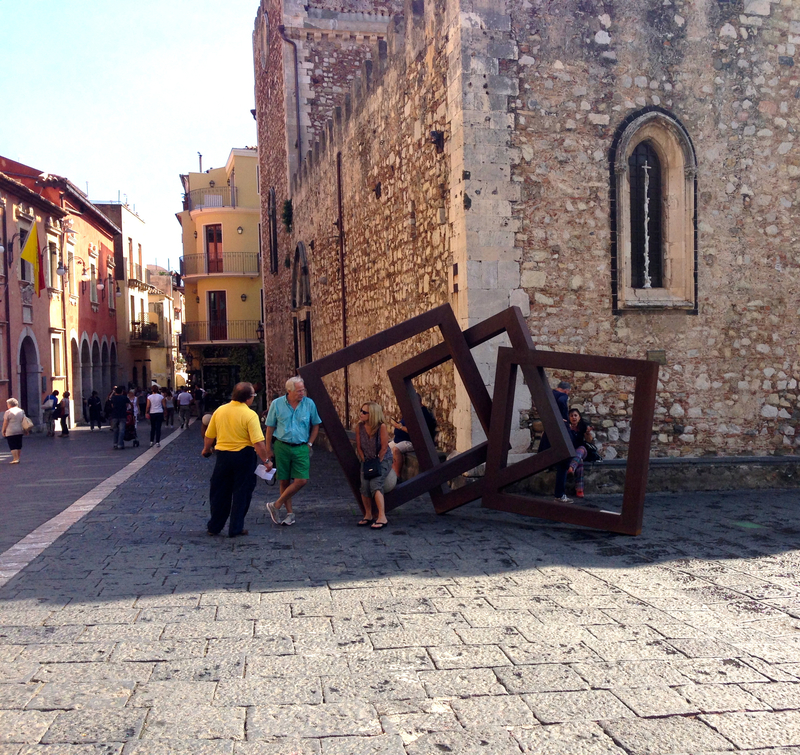 Still, there is one thing my own photos show, that hers do not — how Pirruccio’s exhibit, The Geometry of Space, interacts not only with the medieval environs of Taormina, but with the people who inhabit that space. Vincent Pirruccio’s work is infectious. It draws you in. A compulsion arises — you must interact with it. Children are especially vulnerable, playing on the structures as if they were some gorgeous jungle gym, but adults are subconsciously affected, as well. 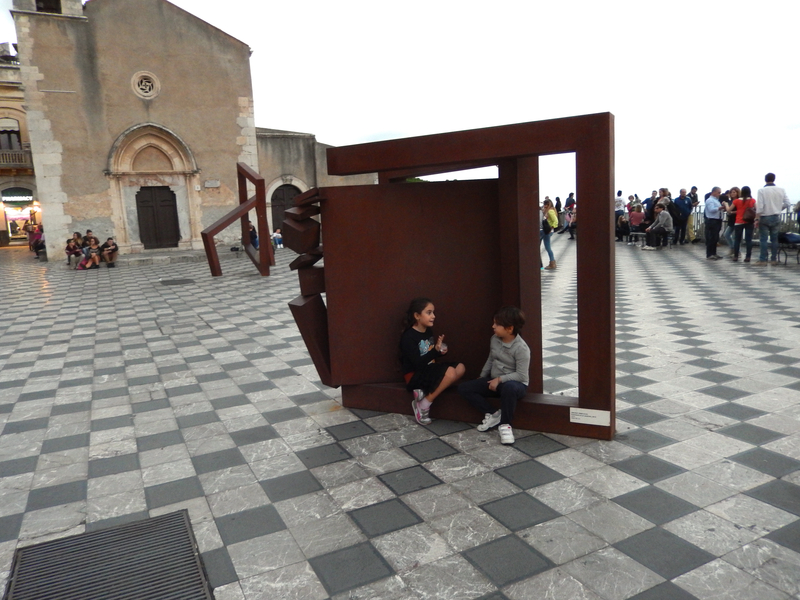 Whether they lean or group around, you can see from the photos below that Pirruccio’s sculptures are rarely alone, even in the vast piazza they inhabit. Often, there is emptiness outside of the zone, but within the immediate radius of the objects, humans congregate and cluster. It brings a sense of warmth, and rapport, to what might otherwise be cold, rusted metal. It is modern art that inspires a sense of community. 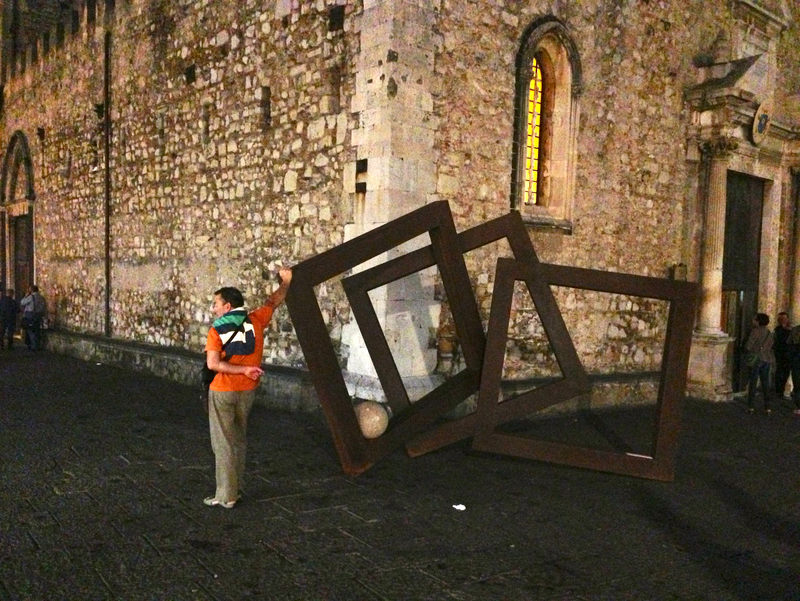 Of course, the feeling about art not being touched is different in Italy. No one batted an eye when kids climbed the structures or one angry man decided to punch the side of piece as he strode by. Perhaps, the emotions Pirruccio’s art elicits were too much for him. As appalled as I was, I was gladder still that these pieces were not cordoned off behind red ropes. In his interview below, Pirruccio, who is rarely on camera, talks about his difficulty talking and communicating with people. I say, anyone who can engage people in his art so completely has no difficulty communicating at all. His voice may be hard to hear with my ears, but my heart hears him every time I view one of his works. Pirruccio paid me the greatest compliment as an interviewer by revealing something he has never shared before. He said that the ball in each of his sculptures represents himself. I hope you’ll take the time to listen to the interview above. The desire to create, to destroy, to have power is universal. Vincent Pirruccio brings those feelings to life. He celebrates our fragility and our strength — the magnificent imperfection and chaos in us all. Wonderfully written piece and thoughtful interview in a faraway place. Good job! Thank you for stopping by Fred, and for the lovely compliment. Loved your interview, Diana. I wish I’d seen you in Italy! Great interview, Diana. Thanks for sharing those lovely photos. I can see why people would want to cluster around the sculptures, as they seem to evoke both strength and playfulness at the same time! What a fabulous post! 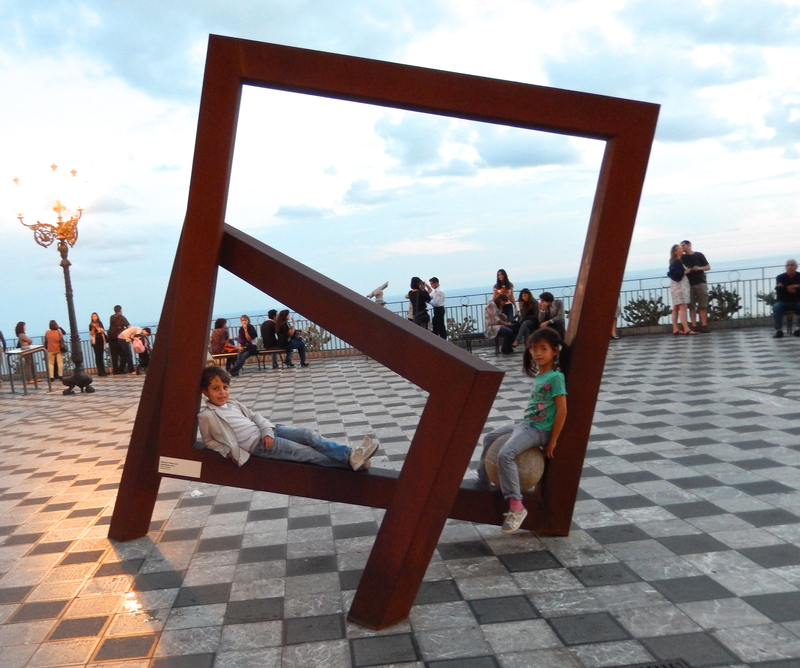 I so enjoyed the pictures with all the different people interacting with the sculptures. And you’re right. It’s wonderful when art isn’t untouchable behind red velvet ropes. It’s actually nice that the “professional” pictures didn’t arrive in time. The ones you posted are perfect! It’s funny how art and sculpture can touch something deep inside us, allowing us to connect with it and each other. It’s so true about our insecurities and chaos. I like to think of it as vulnerability. I so enjoyed your pictures and your post! Thank you so much, Kim. I can’t tell you how much Vincent Pirruccio moved me for just that reason. What beautiful artwork — and photos too! Thank you for sharing them with us. I’m so glad you stopped by, Pintip. Thanks for visiting! Really liked what you wrote and your wonderfully stated appreciation of this man’s beautiful art. Great post. Oh, I’m glad you liked it, Denny. That means the world to me. Lovely, Diana. Such a thoughtful piece and a great interview. I’m not sure why, but I’m always amazed anew at the insecurity of all artists (and probably just everyone). But also inspired by it, because somehow they find a way to overcome it and create anyway. Thank you for sharing! I think what is at the root of it, Gwen, is we feel it’s just us. No one but “me” could feel that insecure, that horrible inside. To see someone share their vulnerability lets us realize, we’re in a common boat and not alone. That makes us stronger and better able to face our demons. I enjoyed your interview with Signor Pirruccio. What I love about his work is the way these sculptures come alive. As the people walk around them the scenes within the frames are constantly changing. It always looks like a different snapshot. The hard rusty metal works so well in this ancient city. They are very interactive and inviting and you are so correct when you say’ “it inspires a sense of community”. I would love to have one of my own! Yes, you are right, Rosie. The snapshot keeps changing. I love that! And I want one in my backyard, too! Wonderful post, Diana. You always bring us such amazing subjects. And I do think I like your photos better than I would’ve liked the professional ones. After all, yours are in the moment and true to life. Nicely done! Aw Carey, you always say the nicest things. Thank you so much! I made friends with award-winning novelist Diana Belchase through our blogs, and I was delighted to meet her in real life last year. Diana has Sicilian heritage and often visits this lovely island. 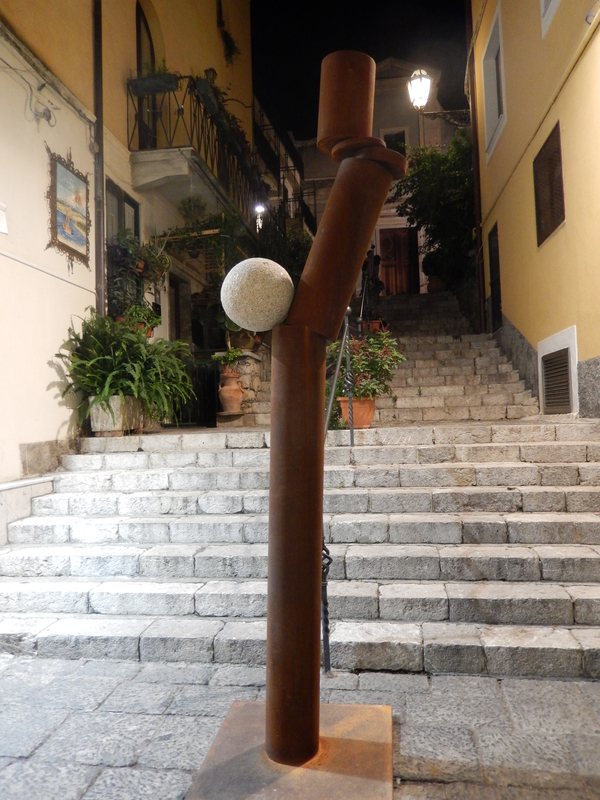 In this post, she interviews Sicilian sculptor Piruccio. 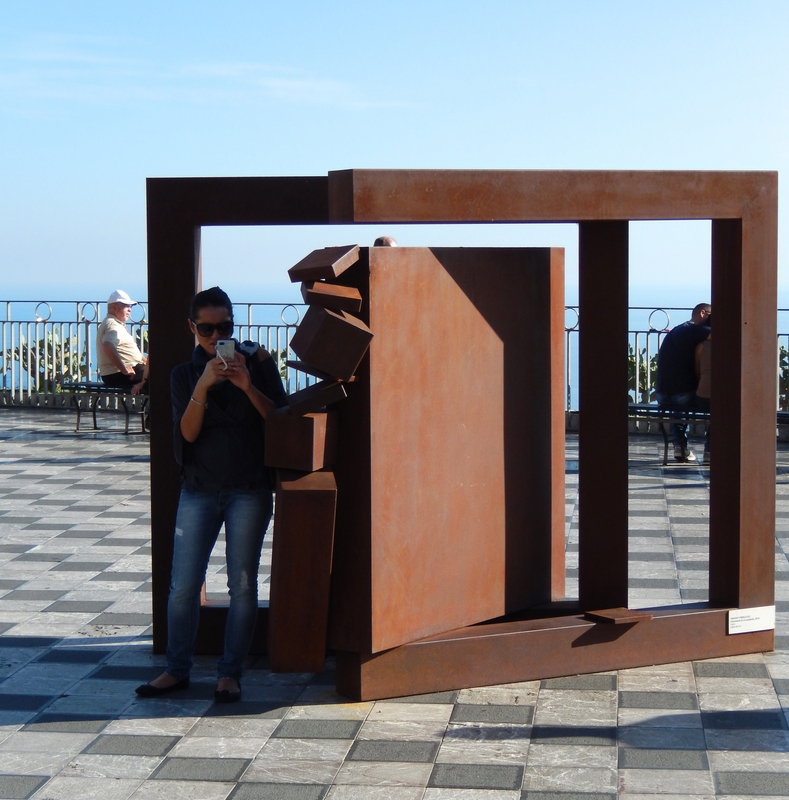 Her article is brought to life by her own wonderful photos of the people of Sicily interacting with his artworks. Just reblogged this wonderful piece. I am sure my readers will enjoy it as much as I did. Thank you for the compliment and for stopping by, TenaciousM! !